Mike Ullery | Daily Call A solar field located on Staunton Street near Garnsey Street contains nearly 7,700 solar panels. Provided photo Trees begin getting removed from the site of the Staunton Street solar field in January. Provided photo On May 14, the installation of 731 piles — which support the racking that support the solar panels — began. Provided photo The racking, which support the solar panels, was installed on May 17. Provided photo The solar panel installation began on May 21. Provided photo The solar field contains 7,672 solar panels, which are each 320-watt panels. Provided photo By June 14, all of the solar panels were up, and on June 28, the solar field was connected to the city’s power grid. 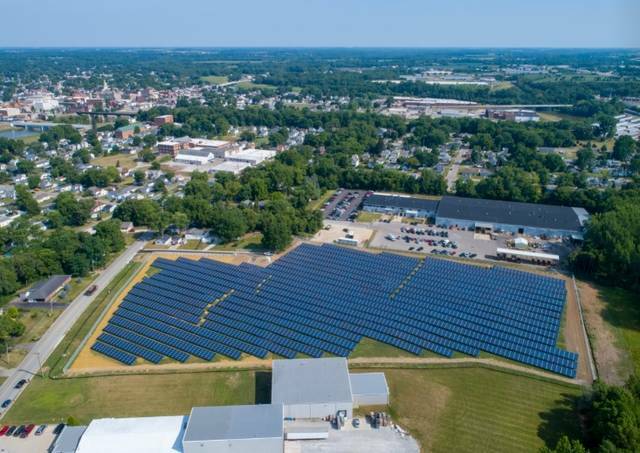 PIQUA — The Staunton Street solar field has been providing power to the city of Piqua for approximately a month, offering the city a renewable energy source and a savings on transmission costs. This eight-acre site is a component of the American Municipal Power (AMP) Solar Phase II project, in which the city is a participant. 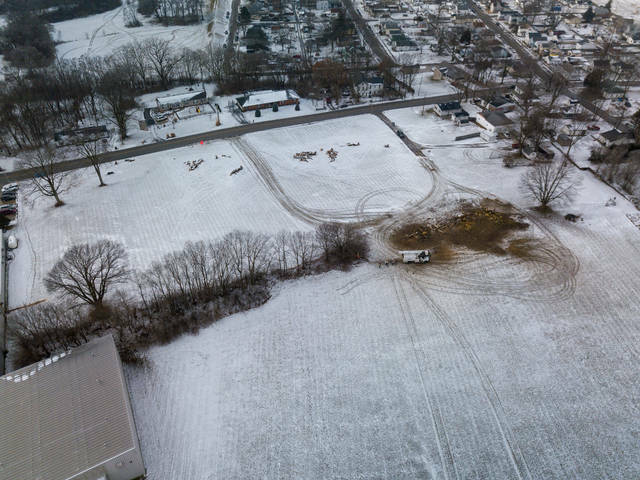 NextEra developed the site — subcontracting with Vaughn Industries out of Carey — before selling the energy generated from that solar field back to AMP members like the city of Piqua. NextEra, which continues to own, operate, and maintain the site, will then see a return on that investment over the 25-year span of AMP’s solar power project. 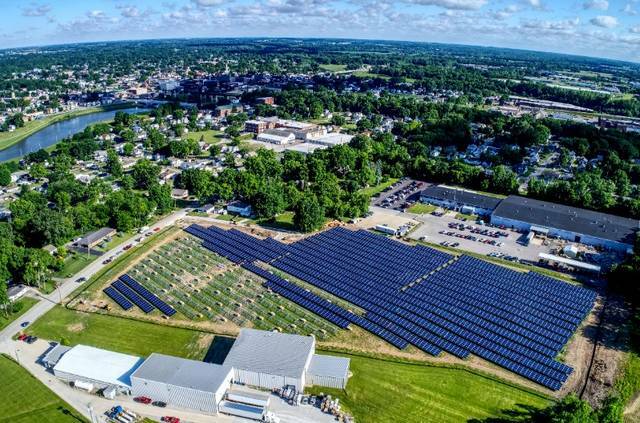 Other municipalities participating in AMP’s Solar Phase II project include Bowling Green, Marshallville, Prospect, Orrville, Versailles, Haskins, and Jackson Center. Outside of Ohio, participants include Coldwater, Michigan; Smyrna, Delaware; and Front Royal, Virginia. “We get an allocation of the power,” Ed Krieger, director of the Piqua Power System, said. 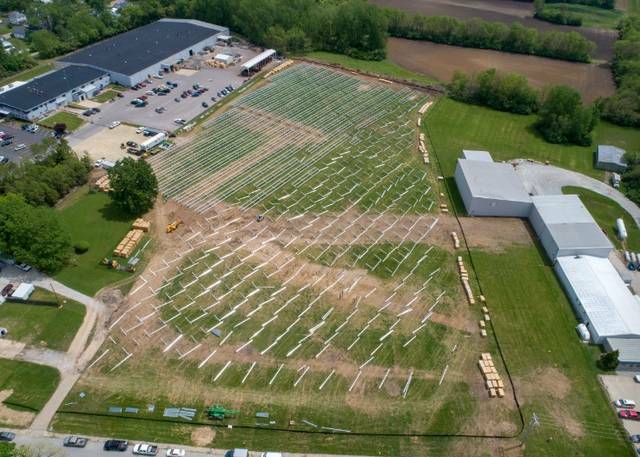 As the solar field is located in Piqua, it provides the city a transmission network savings. “We don’t have to transmit that power,” Krieger said. The cost of the power generated at the site is also $33 per megawatt or 3.3 cents per kilowatt, Krieger said. He also explained that the site is also a low-impact energy generation site as it does not make noise and does not create a glare. “It’s a source of local pride,” Krieger said. The site also provides an education opportunity for school trips. The solar field project took approximately two years of preparation, from discussions with the Energy Board about the possibility of the city participating in AMP’s Solar Phase II project to the acquisition of an eligible site for the project. 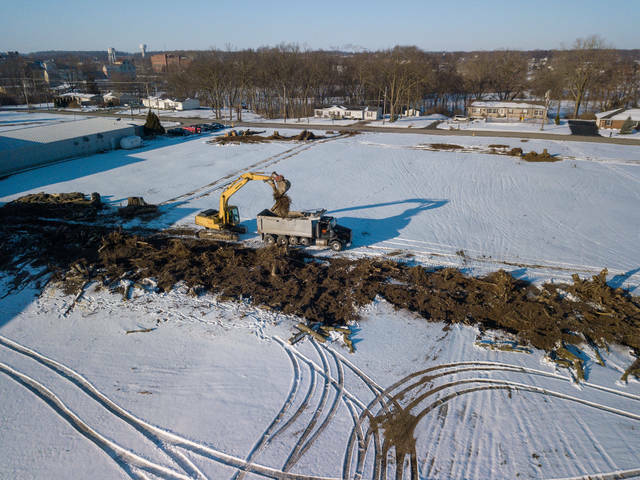 The construction took approximately two months to complete, but prior to the actual construction of the site, trees were cleared from the site in January and tree stumps were removed in March. 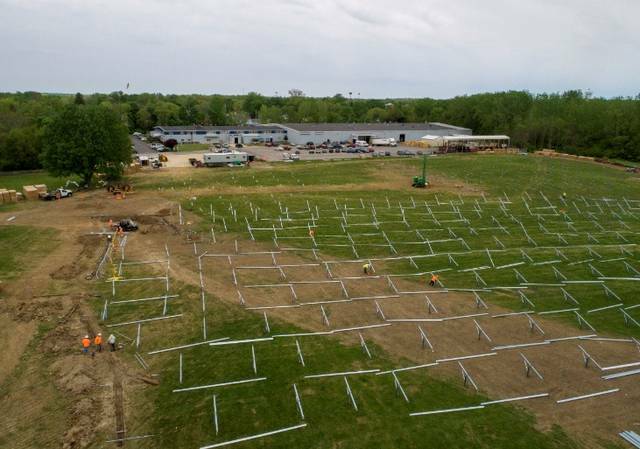 On May 14, the installation of 731 piles — which support the racking that support the solar panels — began. The racking was installed on May 17, and the solar panel installation began on May 21. 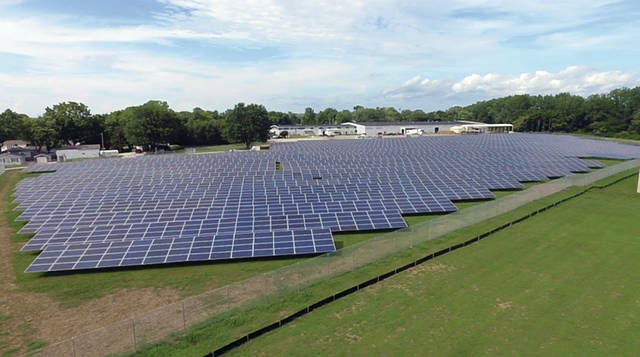 Krieger said by June 14, all of the solar panels were up, and on June 28, the solar field was connected to the city’s power grid. The solar field contains 7,672 solar panels, which are each 320-watt panels. The solar field collects DC electricity, which 39 inverters on seven different inverter islands on the site convert to AC electricity. The solar field can also generate approximately 1.76 megawatts or 1,760 kilowatts of energy at its peak generation, according to Krieger. A second site within the city is also up for consideration as acting as a second solar field on Manier Avenue. The site would be approximately 85 acres and produce over 12 megawatts of energy, or 12,000 kilowatts. While the solar field on Staunton Street is a fixed-access solar field where the panels do not move, the proposed solar field for Manier Avenue would have panels that could move. “It would be able to track the sunlight and produce more power,” Krieger said. The planning commission will be holding a public hearing in regard to the proposed solar field on Manier Avenue during their next meeting at 6 p.. Aug. 14, in commission chambers on the second floor of municipal building, 201 W. Water St.
https://www.dailycall.com/wp-content/uploads/sites/30/2018/08/web1_Mike-Ullery-080718mju_solarfield.jpgMike Ullery | Daily Call A solar field located on Staunton Street near Garnsey Street contains nearly 7,700 solar panels. https://www.dailycall.com/wp-content/uploads/sites/30/2018/08/web1_Clearing-Trees.jpgProvided photo Trees begin getting removed from the site of the Staunton Street solar field in January. https://www.dailycall.com/wp-content/uploads/sites/30/2018/08/web1_pile-installation-copy.jpgProvided photo On May 14, the installation of 731 piles — which support the racking that support the solar panels — began. https://www.dailycall.com/wp-content/uploads/sites/30/2018/08/web1_racking-install-copy.jpgProvided photo The racking, which support the solar panels, was installed on May 17.
https://www.dailycall.com/wp-content/uploads/sites/30/2018/08/web1_Panel-install-copy.jpgProvided photo The solar panel installation began on May 21.
https://www.dailycall.com/wp-content/uploads/sites/30/2018/08/web1_solar-field-June-4-copy.jpgProvided photo The solar field contains 7,672 solar panels, which are each 320-watt panels. 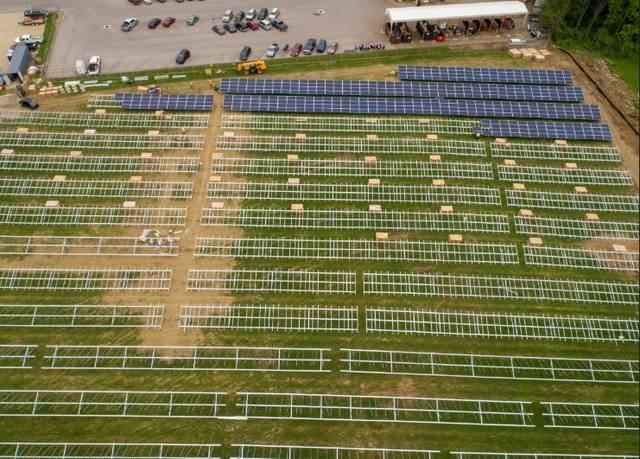 https://www.dailycall.com/wp-content/uploads/sites/30/2018/08/web1_solar-field-completion-copy.jpgProvided photo By June 14, all of the solar panels were up, and on June 28, the solar field was connected to the city’s power grid.